ALL NEW! 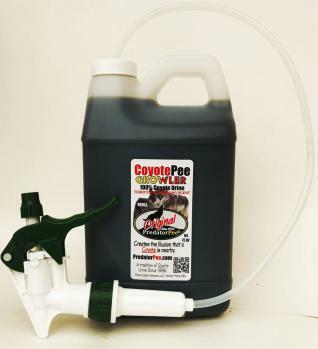 100% Pure PredatorPee® Coyote Urine Growler - 64 oz Jug. Use to refill our 12 oz squirt bottle, 16 oz spray bottle, or simply attach the included adjustable sprayer and squirt right out of the jug! Save $20 over single bottle prices! This small animal deterrent is perfect for raccoons, opossums, rats, and much more!